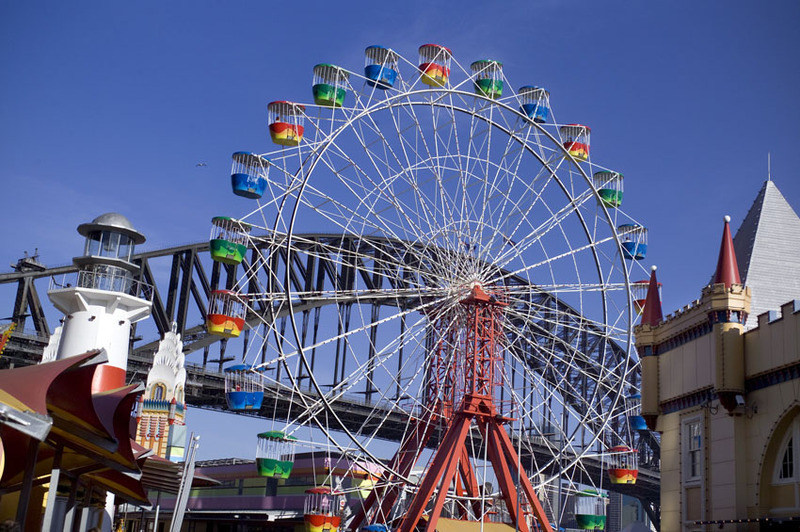 Luna Park is Sydney's premier amusement park featuring fun and games for the entire family. Located at Milsons Point on the north side of Sydney Harbour bridge the park has an amazing outlook over Sydney Harbour. Entry to Luna Park is free so you only need to pay for rides and games. Entry to the park is now free! Coney Island: Australia's only authentic 1930s fun house takes everyone back to their childhood. Experience the thrill of riding the Slides, stumbling through Barrels of Fun, tackling the Mirror Maze or lasting the distance on the Joy Wheel. Wild Mouse: Originally built on site in 1962. It takes you 15 metres above ground while hurling along a 400 metre track in a hair-raising 61 seconds! Don't forget to smile for the camera! Dodgem City: Take on your friends in a crazed race of fun and excitement! Keep a low profile and sneak through the gaps or roar around bumping opponents out of the way as you go. This ride is sure to put a smile on your dial as big as the one on Luna Park's face. Moon Ranger: A ride that starts slow, but will soon have you spinning into the straosphere! The Moon ranger will take you up, and over, the full 360 degress of fun. Rotor: Ever wanted to be a fly on the wall? Stand in the barrel and be pushed up against the side by the centrifugal forces as this ride spins at speeds 60km/h. Once it reaches full speed, the floor will drop away and you'll be left hanging in mid air. See if you can wriggle on to your side and be parallel to the ground! Ferris Wheel: The classic Luna Ferris Wheel takes you 40 metres into the sky to enjoy a fantastic view of the Harbour Bridge, Opera House and Sydney Harbour. 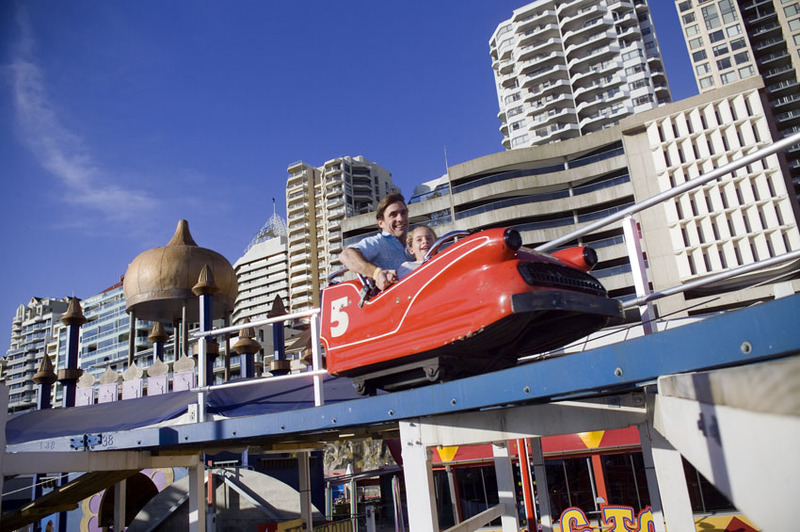 Tango Train: Tango Train is one of Luna Park's all-time favourite rides. Its disco theme and bright lights will thrill you as you're taken to top speed - forwards then backwards. Carousel: The spectacular antique steam Carousel has taken master craftsmen many years to restore. Be dazzled by the immaculate detail, fabulous lights and romantic carnival music that this ride offers. Opening hours vary depending on season and day of week. Various Multiple Ride Passes available. Height restrictions apply for some rides. 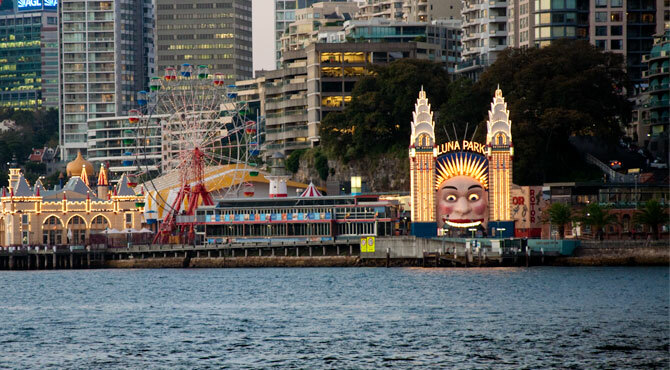 Luna Park is a short walk from Milsons Point train station. Milisons Point station is on the main northern line. From Central you pass through Town Hall and Wynard and then across the Sydney Harbour Bridge to Milsons Point. You can catch a ferry from Circular Quay or Darling Harbour which stops at Milsons Point (Luna Park) wharf..
Luna Park has parking for around 389 cars (fees apply).